The gem impression in Figure 1 presents us with an image that may at first sight seem bizarre: a rooster-headed figure with snakes for legs, wearing Roman military costume. 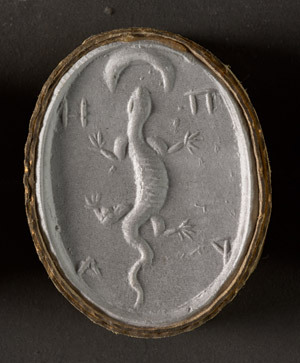 This creature holds up a whip in his left hand, while his right hand holds a shield marked with the Greek letters ΙΑΩ (shown here in reverse, since we are looking at a plaster impression of the original). This object, one of the nineteenth-century plaster impressions in Cornell’s dactyliotheca, appears to have been cast from a heliotrope amulet in Berlin. Although Cornell’s impression records only the obverse (front) of the gem, the reverse of the original was inscribed with the letters ΑΒΡΑCΑΞ . Although this figure looks very different from how popular audiences today might imagine the Greco-Roman pantheon, he is in fact a god or daimon (a type of supernatural entity). The word engraved on the back of the Berlin gem – “Abrasax” – often appears in association with figures resembling this one, and it may serve as a name for the snake-legged being. We find other references to Abrasax (or Abraxas), together with other names of deities and daimones, in a range of magical texts from the Roman empire: papyri preserving magicians’ manuals and collections of spells, as well as curse tablets in which people invoke a wide range of deities and supernatural beings to help them seduce lovers, punish enemies, or defeat rivals. Some papyri even contain instructions for making and consecrating engraved stones for use in spells. As a result of all these associations, scholars often assume that certain Roman-period stones – including the one whose impression is shown in Figure 1 – were used in magical rites and should thus be considered “magical gems”. However, closer examination reveals the slipperiness and complexity of concepts like “magical gems” and “magic” in the ancient world. While many ancient consumers almost certainly did associate objects like this one with “magic,” such an association may have meant different things to different viewers. Ultimately, an engraved gem’s “magical” status would have depended not only on what it looked like, but even more importantly, on what people did with it. As a result, engraved gems like this one raise important questions. How did people decide which ritual actions were socially acceptable and which were forbidden? Who was empowered to make such decisions, and to what degree did people hold differences of opinion? Finally, to what degree can we really separate “magic” from other types of ritual practice in antiquity? Historically, the labeling of engraved gems as “magical” has depended almost entirely on iconographic and textual analysis. Many of the ancient gemstones in museum collections were acquired on the art market at a time when archaeology was in its infancy, so we lack the type of contextual data (that is, information about where and how artifacts were found, and what other objects were found together with them) that could tell us more about how people used these objects. Without such data, scholars have attempted to extrapolate the gems’ functions from the study of (1) the images and inscriptions engraved on them, and (2) ancient texts that refer to engraved gems, or to the types of imagery and inscriptions that appear on them. The snake-legged being in Figure 1 provides one example of what Nagy calls “non-standard iconographic types”: that is to say, types of imagery that do not commonly appear elsewhere in Greco-Roman art. On engraved gems, many such images represent Roman adaptations of foreign (especially, though not exclusively, Egyptian) iconography. For example, the rooster-headed, snake-legged figure in armor appears to represent a later reinterpretation of certain Pharaonic Egyptian depictions of solar deities. Examples of so-called “magical names” or “words of power” include the words inscribed on the original stone: “Iao” and “Abrasax.” “Magical names” are unusual words rarely found outside of magical papyri or curse tablets, where they purport to contain great ritual power and are often presented as the secret or hidden names of gods. Although these names often look like gibberish in Greek or Latin, some of them are derived from foreign languages such as Egyptian or Hebrew. For example, “Iao” appears to be a Greek adaptation of YHWH, the unpronouncable name of the Hebrew God. Characteres (meaning “marks” or “signs”) are non-linguistic signs or symbols, possibly astrological in origin, that often appear in magical texts. John Gager classes them together with “words of power” as “nonstandard forms of speech”. We see two examples of such signs in Figure 2, where they appear on either side of a lion-headed serpent with solar rays emanating from his head. Greek and Latin medical texts tell us that gems engraved with images of this lion-headed serpent, who is often called “Chnoubis,” were believed to heal stomach ailments. As Nagy shows, most modern catalogues of “magical gems” use some combination of the three above criteria to determine which gems should be considered “magical”. A similar approach to identification was implicit in the organization of Cornell’s collection of 19th-century plaster impressions. When the Eichler manufacturing company cast Cornell’s dactyliotheca from the Stosch Collection of gems in the Berlin Museum, they followed J.J. Winckelmann’s 18th-century catalogue of the original collection; the labels on the Eichler impressions use the same headings and categories that Winckelmann used. Winckelmann categorized the gems in the Stosch Collection by iconography. His eighth iconographic category was something of a grab bag, including “Abraxas, engravings with Oriental characters, and modern engravings” – essentially an “Other” category in which he appears to have placed gems whose themes he could not otherwise classify. 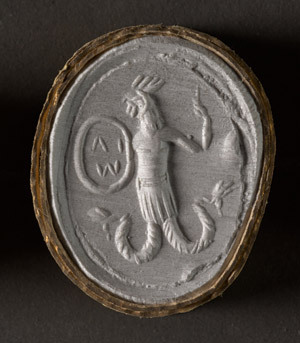 Within this group, Winckelmann classified 58 objects under the subheading of “Abraxas” – a term that, at the time, was used as a catch-all for amulets of the types often considered “magical” today. The gems in this group do not all have inscriptions or imagery referring to Abrasax/Abraxas per se, but rather, they display the full range of criteria commonly taken to characterize “magical gems”: that is, they depict numerous figures of foreign origin and unusual appearance, as well as strings of symbols and words best paralleled in magical papyri and curse tablets from the Roman period. Over a century later, Adolf Furtwängler saw these gems’ association with magic (together with what he considered to be their low artistic quality) as a reason to exclude them from his own catalogs of engraved stones in Berlin. Indeed, he went even farther: as Barb explains, Furtwängler “insisted that this group of stones, which did so little credit to the history of classical glyptic art, be removed to the Department of Egyptology”. Associated with the unrespectable category of magic, perceived as devoid of artistic merit, and dismissed as foreign imports not worthy to be studied with “real” Classical art, these objects effectively suffered a “damnatio memoriae” within Classical scholarship. Not till the mid-twentieth century did “magical gems” begin to attract attention once more, as scholars started to take the study of ancient magical practices more seriously. Today, however, scholars are starting to reassess the definition – and even the existence – of “magical gems” as an iconographic category. Much evidence now suggests that we cannot draw a hard line between “magical” and “non-magical” engraved gems. The imagery and inscriptions on some gemstones clearly do relate to private ritual practices of a type often considered “magic.” However, not all consumers necessarily agreed on what constituted “magic”; and what is more, any given gem type could have served a whole range of different functions in the hands of different users. On their own, iconography and inscriptions cannot tell us everything about how people chose to use these stones. Rituals characterized as “magic” did not only involve gemstones decorated with foreign iconography, “names of power,” or mysterious characteres; some known spells and healing rituals prescribe the use of engraved stones with none of these features. Accordingly, “magical gems” probably did not constitute a fixed, clearly-bounded iconographic category in antiquity, but rather a functional category whose fluid borders were constantly negotiated through practice and user choice. One problem with a solely iconographic definition of “magical gems” is the difficulty of determining what, exactly, constitutes “magical” iconography. As Nagy points out, it can be problematic to identify all gems with “non-standard iconographic types” as magical. For a start, how do we define “standard” iconography? In practice, many publications of engraved gemstones appear to use the presence of “foreign”-looking, especially Egyptianizing, iconography as synonymous with “magical” function. However, the differential treatment of gems with “foreign” and “Greco-Roman” imagery can be misleading. Not all gems with internationalizing imagery were necessarily used in magical rituals. For example, an individual might wear a ring depicting Egyptian deities for a whole range of reasons – as an expression of personal piety, as a visible indication of a particular religious identity, or even (if the ring were made of valuable materials) simply as a display of wealth – without necessarily incorporating that object into other forms of ritual practice. Similarly, textual evidence (magical papyri and ancient treatises on stones) indicates that gems with completely “Greco-Roman” imagery could also frequently be used in magical rituals. For example, stones depicting the sea god Poseidon were said to do everything from warding off shipwreck, to healing eye diseases, to securing romantic success. So while many so-called “Greco-Egyptian” engraved stones surely could be used for magical purposes, we should not be too hasty to assume a complete one-to-one equation of “Eastern” imagery with magical functions – or to forget that gems with more traditionally “Classical” imagery could potentially see uses just as “magical” as their more exotic-looking counterparts. As with many ancient engraved gems in museum collections, we have no archaeological provenience for the objects from which Cornell’s plaster impressions were taken. This absence of contextual information seriously limits our knowledge of how people used these objects. However, textual evidence provides at least some possibilities. When writing or signs of a seemingly “magical” nature (e.g., “words of power” or characteres) appear on gems, they are usually directly readable. This suggests that, in contrast to many other ancient gems, objects with inscriptions of this nature mostly served as amulets rather than sealstones. (Since Cornell’s plaster replicas of the gems are impressions rather than casts, they show the writing in reverse.) Campbell Bonner defines an amulet as “any object which by its contact or its close proximity to the person who owns it, or to any possession of his, exerts power for his good, either by keeping evil from him and his property or by endowing him with positive advantages”. Frequently engraved on both sides and sometimes found in jewelry settings, many stone amulets with “magical” inscriptions were likely used as rings or neckaces. As early as the Classical period, comic poets refer to the use of rings and other amulets to ward off evil influences. These might have been made of a wide range of materials, from metals or stone to organic substances. In preserving the engraved stones’ imagery but not their materials, the Cornell gem impressions suggest that the most important thing about these objects is their iconography – but in fact, many ancient consumers might have been more interested in their raw materials! A number of texts enable us to draw connections between materials and function, informing us that specific types of stones were thought to possess specific magico-medical qualities. As a result, people may have considered many gems’ raw material to be even more important than the images marked on them. Some of the most useful textual evidence for the magical functions of engraved amulets comes from the extensive corpus of Greek and Demotic magical papyri from Roman Egypt. A number of spells in these papyri provide instructions for making and consecrating amulets for use in magical practices. Such spells suggest that when people used images of deities (including gems depicting deities) in magical rites, those images often had to be consecrated and/or “ensouled” in a manner recalling the consecration of divine statues in Egyptian temples. The resulting amulets were thus not only magical objects but divine images, able to receive religious worship in a miniaturized, domesticated form of temple cult. A broad array of ancient texts, from Greek and Demotic magical papyri to treatises on stones and medical writings, suggest that people could use engraved gems and amulets for a wide variety of purposes. Many of those uses were specifically medical: some amulets were thought to help with digestion, pregnancy, back pain, and all manner of other ails. For example, Figure 3 shows the impression of a gem that could have been used to treat eye disease. The obverse of the gem illustrates a lizard underneath a crescent moon. Textual evidence suggests that gems of this type were often used to treat vision problems, and in this particular case, an inscription on the gem itself provides support; the reverse of the original gem bears a Greek inscription saying “Eye, be whole” (κάνθε οὖλε). Other uses of amulets addressed other types of personal needs, from securing the affections of one’s beloved, to punishing one’s enemies, to protecting oneself from dangers. In other words, the ritual functions of engraved gems varied widely, but people often used them to pursue individual, deeply personal goals. However, the application of ritual power to personal goals was not necessarily interpreted as “magic” in all settings. For example, the consultation of an oracle on one’s own behalf does not appear to have been considered mageia throughout most of Greek history. Indeed, part of the difficulty in defining the category of “magical gems” comes from the difficulty of coming up with a single coherent definition of “magic,” either in antiquity or today. The English word “magic” ultimately derives from a Greek root, mageia – but neither the Greek mageia nor its Latin equivalent, magia, mean exactly the same thing as their English descendant. As many scholars have emphasized, the boundaries between “magic,” religion, and medicine in antiquity were blurred and heavily contested. Originally derived from magos (a word referring to Persian priests), the terms mageia and magia could describe a wide range of practices, including the use of potions and drugs, the casting of binding spells, the practice of necromancy, the control of natural phenomena, and more. One of the things these seemingly diverse actions had in common was their stigmatization: for the most part, mageia and magia had negative connotations. In the Roman empire, many types of magic were illegal and punishable with severe penalties, such as death or exile. Even when not illegal, actions classifiable as mageia or magia typically incurred social disapproval – despite the fact that many such activities, such as the casting of binding spells, appear to have been extremely common in practice. So would the consecration, possession, or wearing of certain types of amulets have invariably been considered “magical”? Textual evidence, such as spells for the creation and consecration of amulets, suggests that these objects certainly could be – and undoubtedly often were – used in rituals that ancient audiences considered mageia/magia. When the closest parallels for many voces magicae, characteres, and certain figures on engraved gems come from clearly “magical” texts such as curse tablets or collections of spells, the occasional use of such gems in similarly “magical” rituals seems highly plausible. Similarly, when gems like that in Figure 3 carry inscriptions alluding to their ability to cure diseases, it seems overwhelmingly likely that their functions included ritual healing. So engraved gems could clearly play a role in personal rituals. However, would all ancient consumers always have considered such rituals to be antisocial, disreputable, or otherwise “bad,” as the terms mageia and magia imply? The definitions and applications of mageia and magia were hotly disputed in antiquity, and an action viewed as “magic” by some people might not necessarily be viewed as “magic” by everyone. Rather than serving as an objective description of a clearly-definable class of actions, the label mageia appears to have been a constantly re-negotiated polemical term that people applied to actions they wished to criticize or marginalize, but avoided applying to actions that they wished to practice or defend. As Kindt notes, there were “certain ‘generic’ notions of what constituted magic in the ancient world,” but the exact line between acceptable and unacceptable behavior was often vague: “it was not always clear who could say what was part of official (religious) discourse and what was not”. Some people do seem to have appropriated the label of “magician” (Greek: magos; Latin: magus) for themselves, perhaps in order to attract clients. However, not all people who practiced the sorts of activities often labeled as “magic” necessarily thought of their own activities in such terms: indeed, Naomi Janowitz argues that many practitioners may themselves have “believed that certain other practices were witchcraft and condemned the practitioners as magicians”. For example, when the 2nd c. CE author Apuleius defended himself from the charge of being a magician, he did not deny that he had performed some of the actions he was accused of performing; however, he argued that those actions did not actually count as “magic,” but should instead be considered forms of philosophical and scientific inquiry. The magical status of some amulets, too, may have been open to different interpretations. While a gem engraved with images of exotic deities might have evoked suspicions of magic in some viewers, other viewers may have seen the same object as an unproblematic display of piety. Many of the most seemingly bizarre-looking figures on the gems – including Abrasax and Chnoubis (Figures 1 and 2) – could be understood by at least some audiences as solar creator deities. Similarly, stones engraved with “names of power” or characteres would surely have reminded many ancient viewers of activities that they considered mageia; but individual consumers would still have been able to choose how they used the gems. It was ultimately up to individual users to decide whether or not to engage in specific rituals of the types described in the Greek and Demotic “magical papyri.” And when the owners of engraved stones did choose to use them in personal rituals, those people (and their local communities) might then be able to contribute to ongoing local discourses about how such rituals should be interpreted. Should the community view certain ritual acts as stigmatized mageia, or as legitimate tools for obtaining religious, philosophical, or medical goals? Roman laws do not appear to have prohibited the use of amulets before the Christian period; much of the known anti-magic legislation appears to have targeted hostile magic (e.g., curses or harmful potions), as opposed to rituals related to, say, the maintenance of personal health. Indeed, there is evidence that many rituals we would today consider “healing magic” were completely socially acceptable, and that their practitioners did not think of them as “magic” at all. Even Cato the Elder, a statesman often presented as the ultimate embodiment of Roman moral virtue, recommends the treatment of dislocated joints with incantations and rituals; and Apuleius explicitly states that healing incantations are the business of doctors rather than magicians, adding that “Nothing that is done for the sake of health can be a criminal offense”. So when people used amulets for healing purposes – for example, attempting to treat stomach problems with a “Chnoubis” gem (Figure 2) – they may well have seen this behavior as perfectly respectable, and totally different from the sinister activities of a magus. Some others may have looked down on such behavior; for example, the 1st-2nd c. CE Greek writer Plutarch presents medical amulet use as a rather silly, if harmless, superstition. As with so many other aspects of personal ritual practice, individual opinions and practices probably varied widely. Furthermore, within the diverse Roman world, people in different parts of the empire may have held quite different attitudes toward “magic.” In Egypt, for example, the indigenous concept that most closely approximated “magic” – heka – lacked the stigma of mageia. For Egyptians, heka was essentially a natural force which individuals could control through proper ritual performance; on its own, it was neither inherently good nor inherently bad. As a result, Egyptians may have been less worried about the social implications of being perceived as magicians – a cultural tendency that likely contributed to Roman perceptions of Egyptians as skilled in magic, and to the popularity of Egyptianizing themes in Roman magical practices. Since many different types of engraved gems could potentially be used in magical rituals, a gem’s status as “magical” arguably depends less on its appearance than on how its owner chose to interpret and use it. Certainly, not all gems used in magical rituals had foreign or exotic imagery. However, allusions to “Eastern” religious and ritual traditions – as in Figure 1, with its Egyptianizing deity and Hebrew “name of power” – are so common that they must have been particularly attractive to consumers. Regardless of whether consumers chose to use them in actual ritual practice, such gems’ international iconography relates to broader trends toward eclecticism and adaptation in Roman art. A vast amount of recent scholarship has explored the Roman emulation, recombination, and transformation of motifs from different regions of the empire. While much of this work has focused on Roman receptions of Greek art, scholars are increasingly taking parallel approaches to Roman emulations of Egyptian art as well. The use of culturally diverse motifs and themes on engraved gems – whether used for “magical” or any other purposes – thus speaks not only to Roman associations of magic with the cultural “Other,” but also to a wider-reaching impulse to incorporate elements from the whole span of the empire into Roman art. The material culture of this pan-Mediterranean empire thus itself incorporated elements from all over the Mediterranean, conveying an implicit message that all parts of the empire could (and should) function together as part of a whole. When people employed internationalizing gemstones in personal magical, religious, and/or medical rituals, they applied these images of empire-wide koine to their own individual needs, putting the global to work for the personal. The Cornell impressions thus represent the final step in these objects’ participation in long-term, large-scale histories of emulation, replication, and adaptation. Much as the “original” gemstones themselves featured recombinations and transformations of much older Greek, Roman, Egyptian, Jewish, Christian, and other Near Eastern motifs, so too do the modern plaster impressions represent yet another form of replication (and transformation). That chain of replication and representation now continues in this website’s digital photos, which translate the gems’ images into yet another medium. This database of digital photos – like the creation of the plaster impressions that preceded it, and the even earlier processes of antiquarian collecting that produced the original Stosch Collection – represents yet another recombination and reinterpretation of the original artifacts. At each stage of replication, objects from originally disparate sources have been collected, displayed together, and classified in ways that suggest different interpretations and create new forms of meaning. Cornell’s impressions of engraved gemstones thus provide evidence not only for the interconnections between magic, religion, and medicine in the Greco-Roman world; they also testify to the changing modern receptions of ancient material culture, and the ways that history of reception continues to shape our relationship to the past. Bonner, C. 1950. Studies in Magical Amulets: Chiefly Graeco-Egyptian. Ann Arbor. The Campbell Bonner Magical Gems Database (http://www2.szepmuveszeti.hu/talismans/). Dickie, M.W. 2001. Magic and Magicians in the Greco-Roman World. London. Nagy, Á.M. 2012. “Daktylios pharmakites. Magical Healing Gems and Rings in the Graeco-Roman World.” In I. Csepregi and C. Burnett, eds., Ritual Healing: Magic, Ritual and Medical Therapy from Antiquity until the Early Modern Period, pp. 71-106. Florence. Ogden, D. 2002. Magic, Witchcraft, and Ghosts in the Greek and Roman Worlds: A Sourcebook. Oxford. Audollent, A. 1967 . Defixionum Tabellae. Frankfurt. Barrett, C.E. In press. “Terracotta Figurines and the Archaeology of Ritual: Domestic Cult in Greco-Roman Egypt.” In C. Barrett et al. (eds. ), Silent Participants: Terracottas as Ritual Objects (edited book section within Figurines en contexte: iconographie et fonction(s), general eds. S. Huysecom-Haxhi and A. Muller). Villeneuve d’Ascq. Barb, A.A. 1953. “Diva Matrix: A Faked Gnostic Intaglio in the Possession of P.P. Rubens and the Iconology of a Symbol.” Journal of the Warburg and Courtauld Institutes 16: 193-238. Bell, C. 1997. Ritual: Perspectives and Dimensions. Oxford. Bergmann, B. 1995. “Greek Masterpieces and Roman Recreative Fictions.” Harvard Studies in Classical Philology 97: 79-120. Betz, H.D. 1992. The Greek Magical Papyri in Translation, Including the Demotic Spells. Volume I: Texts. Second edition. Chicago. Bohak, G. 1997. “A Note on the Chnoubis Gem from Tel Dor.” Israel Exploration Journal 47: 255-256. ---. 2003. “Hebrew, Hebrew Everywhere? Notes on the Interpretation of Voces Magicae.” In S. Noegel, J. Walker, and B. Wheeler, eds., Prayer, Magic, and the Stars in the Ancient and Late Antique World, pp. 69-82. University Park, PA.
Collins, D. 2008. Magic in the Ancient Greek World. Malden, MA. Dasen, V. 2014. “Healing Images. Gems and Medicine.” Oxford Journal of Archaeology 33: 177-191. Dasen, V., and Á.M. Nagy. 2012. “Le serpent léontocéphale Chnoubis et la magie de l’époque romaine impériale.” Anthropozoologica 47: 291-314. Delatte, A. and P. Derchain. 1964. Les intailles magiques gréco-égyptiennes. Paris. Dieleman, J. 2005. Priests, Tongues, and Rites: The London-Leiden Magical Manuscripts and Translation in Egyptian Ritual (100-300 CE). Leiden. Edmonds, R. 2012. “Magic in the Ancient Greco-Roman World.” In D. Clayman, ed., Oxford Bibliographies in Classics, <http://www.oxfordbibliographies.com/view/document/obo-9780195389661/obo-.... New York. Elsner, J. 2006. “Classicism in Roman Art.” In J.I. Porter, Classical Pasts: The Classical Traditions of Greece and Rome, pp. 270-297. Princeton. Faraone, C. 2011. “Text, Image and Medium: The Evolution of Graeco-Roman Magical Gemstones.” In C. Entwistle and N. Adams, ed., Gems of Heaven: Recent Research on Engraved Gemstones in Late Antiquity, pp. 50-61. London. Fowden, G. 1986. The Egyptian Hermes: A Historical Approach to the Late Pagan Mind. Princeton. Fowler, R.L. 1995. “Greek Magic, Greek Religion.” Illinois Classical Studies 20: 1-22. Frankfurter, D. 1998. Religion in Roman Egypt: Assimilation and Resistance. Princeton. Furtwängler, A. 1896. Beschreibung der geschnittenen Steine im Antiquarium. Berlin. ---. 1900. Die antiken Gemmen. Vol. 3. Leipzig/Berlin. Gager, J.G., ed. 1992. Curse Tablets and Binding Spells from the Ancient World. Oxford. Gasparro, G.S. 2003. “Le gemme magiche come oggetto d’indagine storico-religiosa.” In A. Mastrocinque, ed., Sylloge Gemmarum Gnosticarum I, pp. 11-48. Rome. Gazda, E.K., ed. 2002. The Ancient Art of Emulation: Studies in Artistic Originality and Tradition from the Present to Classical Antiquity. Ann Arbor. Graf, F. 1997. Magic in the Ancient World. Trans. F. Philip. Cambridge, MA. ---. 1999. “Magic and Divination.” In D.R. Jordan, H. Montgomery, and E. Thomassen, eds., The World of Ancient Magic, pp. 283-298. Bergen. Harrauer, C. 1996. Der neue Pauly, s.v. “Abraxas.” Stuttgart. Hölscher, T. 2004. The Language of Images in Roman Art. Trans. A. Snodgrass and A. Künzl-Snodgrass. Cambridge. Hopfner, T. 1927. “Λιθικά.” In A.Pauly, G. Wissowa, and W. Kroll, eds., Real-Encyclopädie der klassischen Altertumswissenschaft. Vol. 13, pp. 747-769. Stuttgart. Hornung, E. 2001. The Secret Lore of Egypt: Its Impact on the West. Trans. D. Lorton. Ithaca. Huet, V. and S. Wyler. 2005. “‘Copies romaines d’un original grec,’ ou les arts grecs revisités par les Romains.” Mètis 3: 151-177. Hünemörder, C. 2005. “Lithika.” In H. Cancik and H. Schneider, eds., Brill’s New Pauly. English edition, vol. 7, pp. 723-724. Stuttgart. Hunink, V.J.C. 2002. “Apuleius, Apology: Translation.” In S.J. Harrison, J.L. Hilton, and V.J.C. Hunink, eds., Apuleius: Rhetorical Works, pp. 25-121. Oxford. Janowitz, N. 2001. Magic in the Roman World: Pagans, Jews and Christians. London/New York. Kákosy, L. 1982. “Decans in Late-Egyptian Religion.” Oikumene 3: 163-191. ---. 1995. “Egypt in Ancient Greek and Roman Thought.” In J.M. Sasson, ed., Civilizations of the Ancient Near East. Vol. 1, pp. 3-14. Kindt, J. 2012. Rethinking Greek Religion. Cambridge. Kühn, C.G. 1826. Claudii Galeni Opera Omnia. Vol. 12. Leipzig. Lang, J. 2013. Review of R. Veymiers, Ἵλεως τῷ φοροῦντι. Sérapis sur les gemmes et les bijoux antiques. Gnomon 85: 256-262. Luck, G. 2006. Arcana Mundi: Magic and the Occult in the Greek and Roman Worlds. 2nd edition. Baltimore. Mastrocinque, A. 2003. “Le gemme gnostiche.” In A. Mastrocinque, ed., Sylloge Gemmarum Gnosticarum I, pp. 11-48. Rome. Michel, S. 2001. Die magischen Gemmen im Britischen Museum. 2 vols. London. ---. 2004. Die magischen Gemmen: Zu Bildern und Zauberformeln auf geschnittenen Steinen der Antike und Neuzeit. Berlin. Moyer, I.S., and J. Dieleman. 2003. “Miniaturization and the Opening of the Mouth in a Greek magical text (PGM XII.270-350).” Journal of Ancient Near Eastern Religions 3: 47-72. Perry, E. 2005. The Aesthetics of Emulation in the Visual Arts of Ancient Rome. Cambridge. Philipp, H. 1986. Mira et Magica: Gemmen im Ägyptischen Museum der Staatlichen Museen. Mainz am Rhein. Plantzos, D. 1999. Hellenistic Engraved Gems. Oxford. Platt, V. 2006. “Making an Impression: Replication and the Ontology of the Graeco-Roman Seal Stone.” Art History 29: 233-257. ---. 2007. “Burning Butterflies: Seals, Symbols and the Soul in Antiquity.” In L. Gilmour, ed., Pagans and Christians – From Antiquity to the Middle Ages, pp. 89-99. Oxford. Preisendanz, K., and A. Henrichs, eds. 1973-1974 [1928-1941]. Papyri graecae magicae. Die griechischen Zauberpapyri. Stuttgart. Quack, J.F. 2004. Review of S. Michel, Die magischen Gemmen im Britischen Museum. Gnomon 76: 257-262. Ritner, R. 1993. The Mechanics of Ancient Egyptian Magical Practice. Chicago. Seland, T. 2006. “Philo, Magic and Balaam: Neglected Aspects of Philo’s Exposition of the Balaam Story.” In J. Fotopoulos, ed., The New Testament and Early Christian Literature in Greco-Roman Context: Studies in Honor of David E. Aune, pp. 333-348. Leiden. Sfameni, C. 2010. “Magic in Late Antiquity: The Evidence of Magical Gems.” In D.M. Gwynn and S. Bangert, eds., Religious Diversity in Late Antiquity, pp. 435-476. Leiden. Smith, J.Z. 1995. “Trading Places.” In M. Meyer and P. Mirecki, Ancient Magic and Ritual Power, pp. 13-27. Leiden. Smith, M. 1979. “Relations between Magical Papyri and Magical Gems.” In J. Bingen and G. Nachtergael, Actes du XVe Congrès International de Papyrologie, pp. 129-136. Brussels. Swetnam-Burland, M. 2007. “Egyptian Objects, Roman Contexts. A Taste for Aegyptiaca in Italy.” In L. Bricault, M.J. Versluys, and P.G.P. Meyboom, eds., Nile into Tiber. Egypt in the Roman World, pp. 113-136. Leiden. Thissen, H.J. 1991. “Ägyptologische Beiträge zu den griechischen magischen Papyri.” In U. Verhoeven and E. Graefe, eds., Religion und Philosophie im alten Ägypten. Festgabe für Philippe Derchain zu seinem 65. Geburtstag am 24. Juli 1991, pp. 293-302. Leuven. Thomassen, E. 1999. “Is Magic a Subclass of Ritual?” In D. R. Jordan, H. Mongomery, and E. Thomassen, eds., The World of Ancient Magic: Papers from the First International Samson Eitrem Seminar at the Norwegian Institute at Athens 4-8 May 1997. Papers from the Norwegian Institute at Athens 4. Bergen. Veymiers, R. 2009. Ἵλεως τῷ φοροῦντι. Sérapis sur les gemmes et les bijoux antiques. Brussels. Winckelmann, J.J. 1760. Description des pierres gravées du feu Baron de Stosch. Florence. Wünsch, R., ed. 1897. Defixionum tabellae Atticae. Inscriptiones Graecae III.3. Berlin. Wyler, S. 2006. “Roman Replications of Greek Art at the Villa della Farnesina.” Art History 29: 213-232. Yébenes, S.P. 2010. “Magic at Sea: Amulets for Navigation.” In R.L. Gordon and F.M. Simón, eds., Magical Practice in the Latin West, pp. 457-486. Leiden. Zwierlein-Diehl, E. 1992. Magische Amulette und andere Gemmen des Instituts für Altertumskunde der Universität zu Köln. Opladen. ---. 2007. Antike Gemmen und ihr Nachleben. Berlin. Winckelmann 1760: 44 (identified as red and green jasper); Philipp 1986: 103, no. 160, pl. 41, fig. 160a-c.
 For iconographic analysis of the snake-legged figure and his likely identification as a solar deity, see Bonner 1950: 123-139; Darnell 2004: 374-424, esp. 385-390; cf. also Delatte and Derchain 1964: 23-42; Michel 2004: 239-249. It is not certain that “Abrasax” should always be understood as the personal name of the anguipede (snake-legged) deity. The term is not exclusively associated with anguipede images, and is also used more widely as a “word of power” or “magical name”: see, for example, Bonner 1956: 133-135; Philipp 1986: 8; Harrauer 1996. For a corpus of published anguipede gems, see Michel 2004: 239-250. E.g., many examples in Wünsch 1897; Audollent 1967 ; Preisendanz and Henrichs 1973-1974; Betz 1992; Gager 1992. For publications of additional related texts, see the extensive bibliography of Edmonds 2012. On the consecration of gems, amulets, lamellae, phylacteries, and figurines, see, e.g., PGM IV.751-788, 1596-1715, 2145-2240, V.213-303, VII.429-458, VII.579-590, XII.14-95, XII.201-269, XII.270-350, XXXVI.35-68 (edition: Preisendanz and Henrichs 1973-1974; translation: Betz 1992). On the connections between “magical gems” and “magical papyri,” as well as some major discrepancies in the contents of these two types of material, see Smith 1979. See, e.g., the inclusion of the Berlin heliotrope in Philipp’s catalog of objects she considers to be “magical gems”: Philipp 1986: no. 160. On the limited number of “magical” gems from known contexts: Philipp provides the most comprehensive list and bibliography (1986: 8-10, n. 18), to which later supplements can be found in Michel (2004: 2 n. 7) and Nagy (2012: 73 n. 8). Originally thought to be associated with Gnosticism, this special class of gems later came to be identified as “magical.” See the short historical overviews in Zwierlein-Diehl 1992: 12-15; Gasparro 2003: 15-16; Michel 2004: 16-34; Sfameni 2010: 436-437. On the stylistic dating of Roman-period gems, see Zwierlein-Diehl 2007: 132-133, 184-185. On the secret names of magical deities, see Michel 2004: 11. For some of the most common voces magicae and “words of power” on gemstones, see Mastrocinque 2003: 98-112. Note, however, the cautions of Bohak 2003. Gager 1992: 7-9. For a recent discussion of characteres, see Mastrocinque 2003: 90-98. 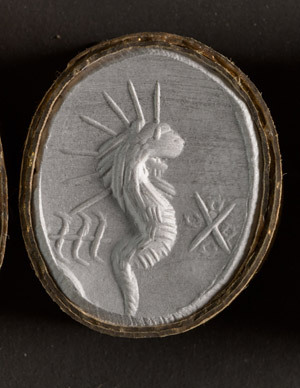 The original of this plaster impression appears to be a chalcedony stone in Berlin (Winckelmann 1760: 564, no. 22; Philipp 1986: no. 126). The sign immediately behind the lion-headed serpent is the so-called “Chnoubis sign” (id., p. 88), on which see most recently Dasen and Nagy 2012: 301-302. E.g., Galen, On the Mixtures and Powers of Simple Drugs 10.19, ed. Kühn 1826: 12.207 (though note that Galen himself seems to think it is the actual stone, rather than the image carved on it, that has medicinal properties). For a complete list of Greek and Latin textual sources (medical, Hermetic, and mineralogical) referring to Chnoubis and his stomach-easing properties, see Dasen and Nagy 2012: 309-310. The discussion of the Galen passage in Bonner (1950: 54-55) remains useful. For a more recent discussion of literary sources on Chnoubis, see Dasen and Nagy 2012 (esp. pp. 295-296, 298-299); and see also further references in Nagy 2012: 77-79 with n. 25. For some references to Chnoubis gems in Rabbinical literature, see Bohak 1997: 256; Dasen and Nagy 2012: 303-305, 310. For a corpus of published Chnoubis gems, see Michel 2004: 255-263. In their recent reanalysis of Chnoubis gems’ iconography and uses, Dasen and Nagy argue persuasively that people used these objects to treat a variety of internal organs (2012: 299-300). Nagy 2012: 72-91 (with a well-argued critique of this approach to the problem of defining “magical gems”). On the former use of the term Abrasax/Abraxas to designate magical amulets more broadly, see Barb 1953: 193; Delatte and Derchain 1964: 23; Philipp 1986: 8, 22; Michel 2004: 1. Furtwängler 1896: x, 1900: 363; see discussion in Philipp 1986: 2-3. For historical overviews of research on magical gems: Barb 1953: 193-194; Philipp 1986: 1-4. Cf. the remarks of Gasparro 2003: 26. See, e.g., Lang’s observation (2013: 256 n. 2) that until the publication of Veymiers’ (2009) study, the most comprehensive previous publication of gems depicting the Greco-Egyptian god Sarapis (Michel 2004: 324-327) addressed them under the heading of “magical” material. The majority of gems with overtly “magical” iconography were likely not extremely expensive (Philipp 1986: 15). However, engraved gems could sometimes be items of significant worth (Plantzos 1999: 105-108). See sources collected in Bonner 1950: 14; Yébenes 2010; Nagy 2012: 85. E.g., Aristophanes, Wealth 883-885. For a fuller overview of literary evidence for such amulets, see Nagy 2012: 91-106. For example, magical papyri sometimes refer to amulets made of organic materials (e.g., PDM xiv.295-308; PGM XXXVI.320-332). On ancient ideas about the properties (magical and otherwise) of stones and minerals, see Dioscorides, On Medical Materials 5.74-162; Pliny, Natural History 33-37; Theophrastus, On Stones; and the other Lithika, or books on stones, whose bibliography is collected in Hopfner 1927 and Hünemörder 2014. See also further sources assembled by Faraone 2011; Nagy 2012: 84-86. On consecration, see above, n. 6. For similarities between some of these rites and the Egyptian “Opening of the Mouth” ceremony, which was used to enliven divine statues and mummies, see Thissen 1991: 299-300; Moyer and Dieleman 2003; Dieleman 2005: 170-182; Barrett, in press. On the “miniaturization” of temple rituals and their adaptation to private, household, and/or “magical” cult in Roman Egypt: Smith 1995: 20-27; Moyer and Dieleman 2003. On healing gems, see most recently Dasen 2014. See sources in Bonner 1950: 69-71; Michel 2004: 157-158, 264. See Philipp 1986: no. 123. Cf. Thomassen’s definition of magic as “the appropriation of ritual power for personal ends” (1999: 65). Note, however, that Roman emperors did prohibit many forms of unauthorized divination, and that many “magical” divination rites appropriated symbols and practices associated with major oracular shrines (Graf 1999). Lucian (Lover of Lies 38) describes a magical ring decorated with an image of the oracular Apollo of Delphi. See Bell (1997: 46-52) for an overview of the major historical developments in scholarly approaches to, and definitions of, “magic” as a cross-cultural concept. Of the incredibly numerous publications on this topic in the past two decades, one of the most recent contributions is Kindt 2012: 90-122. For a comprehensive recent bibliography on Greco-Roman magic, see Edmonds 2012. On the development of the concept of mageia in fifth-century Greek thought, see Graf 1997: 20-35. For an overview of the legal status of ancient magic: Collins 2008: 132-165. E.g., Gager 1992: 119-120; Kindt 2012: 95-97. However, Smith (1979) was right to caution that the correspondences between “magical papyri” and “magical gems” are by no means complete; for example, many of the figures prominent in the gems appear in the papyri only seldom, or not at all. See, e.g., Graf 1997: 29; Janowitz 2001; Kindt 2012: 99, 107-109, 115-122. Cf. Fowler: “one man’s magic is another man’s religion” (1995: 21). On some of the other Greek and Latin terms for, and attitudes towards, magicians, diviners, sorcerers, and similar figures: Graf 1997: 20-60; Dickie 2001. See, e.g., the sources cited in Seland (2006: 335). Frankfurter argues that some Egyptian priests presented themselves as magicians to Greek and Roman audiences as a form of “stereotype appropriation” (1998: 224-237). See also Dickie (2001: 229-231) and Dieleman (2005: 253-254, 287) for similiar arguments that some Egyptian priests profited from Roman beliefs in their amazing magic-working powers. See, for example, Apuleius’ statement that philosophers are often unjustly accused of being magicians (Apology 27.1-4), and his argument that he was gathering fish for philosophical and medical research rather than love magic (Apology 29-41). In addition to contesting his accusers’ interpretations of some of his actions, Apuleius also denies outright a number of other charges (e.g., inter alia, the accusation that he performed mysterious nocturnal rites at an inn: Apology 57-60). Bonner 1950: 123-139, 154; Zwierlein-Diehl 1992: 17, 28-36; Michel 2001: 1.193; Darnell 2004: 374-424, esp. 385-390. Without the solar rays emanating from his head, Chnoubis appears to represent a decan (a type of deified star or constellation important in Egyptian astronomy, timekeeping, and religion); when he wears this radiate crown, however, it marks him as a supreme solar divinity (Dasen and Nagy 2012, esp. p. 298, 306-307, 309). On Egyptian decans and astral religion, and their interaction with Greco-Roman astrological traditions, see Kákosy 1982; Hornung 2001: 26-33, 211; a new monograph on this topic is currently in preparation by Joachim Quack (as announced by Dasen and Nagy 2012: 292 and passim). By late antiquity, however, we do have evidence of Christian clerics inveighing against amulets (Dickie 2001: 253-254, 261, 280-281, 283-284, 289-290, 304-311). In the fourth century, Ammianus Marcellinus claims that the Christian emperor Constantius II even executed people for wearing amulets (19.12.14), although Dickie expresses some doubts as to whether this actually occurred (2001: 254-257). See discussion, and references to most of the relevant primary sources, in Dickie 2001: 24-25, 129-130, 252. Cato, De agri cultura 160. For some comparanda, see Luck 2006: 108-109. Nihil enim quod salutis ferendae gratia fit, criminosum est (Apuleius, Apology 40.4); trans. Hunink 2002: 64. Plutarch, Life of Pericles 38 (referring to a healing amulet as ἀβελτερία, “silliness”). The Augustan poet Grattius expresses similar skepticism about the effectiveness of amulets on dogs (Cynegeticon 399-407; see discussion in Dickie 2001: 129-130). On the Greco-Roman association of Egypt with magic and other types of esoteric lore, see (inter alia) Fowden 1986; Kákosy 1995: 11-13; Frankfurter 1998: 233-237; Dickie 2001: 203-205, 229-231; Hornung 2001: 1-72; Dieleman 2005: 168-169, 239-254. A few selections from within the vast literature: Bergmann 1995; Gazda, ed. 2002; Hölscher 2004; Huet and Wyler 2005; Perry 2005; Wyler 2006. On the relevance of certain types of engraved gemstone (specifically, sealstones) to the study of replication in ancient art, see Platt 2006.